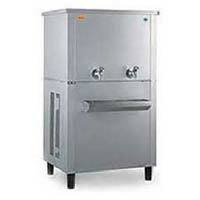 Capitalizing on our sophisticated quality analysis facility, we have evolved as the noteworthy Importer and Supplier of the Water Cooler from Karnataka, India. 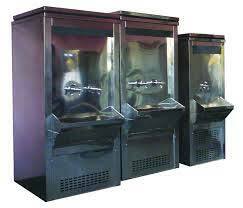 By using innovative technology, these Water Coolers absorb the heat from water & dispense it chilled. Acclaimed for easy installation, low upkeep, energy efficiency and unrivaled functionality; these Water Cooler are procurable from us in different specifications at cost-effective prices. 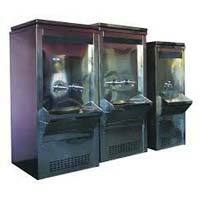 Every water cooler, includes both bottled and mains (plumbed in) water coolers, has a reservoirs inside the casing that holds water. This reservoir is where the water is cooled prior to being dispensed. Mains or plumbed in, water coolers often have a water filter between the incoming water supply and the reservoir to improve to improve the quality of water. The refrigerant system works in almost exactly the same way as fridge at home. A compressor compresses a gas, this causes the temperature of the gas to rise, the gas is then passed to a condenser where the heat from the gas dissipates and the gas cools down until it becomes a liquid. Once the gas is cold, it is forced through an expansion valve, which causes it to drop in pressure and become even colder. 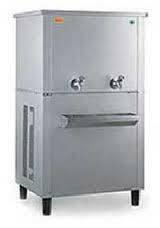 At this point the gas is present in the evaporator which absorbs the heat from the water held in the reservoir. This then heats the refrigerant, which then starts the cycle again. The cycle is kept going using electricity to drive a pump. 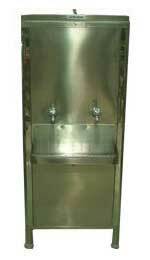 Once the water is cold, it’s ready to be dispensed. One inlet and Two outlet with Taps & Drain Tray. 1TR SP/TP Sealed type Compressor. 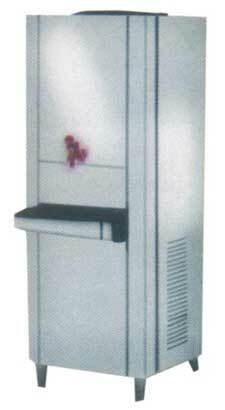 250 Ltrs Capacity Water Refrigerator (100Ltrs/Hr.) 1 no.